3.1: Oriel College Oxford … Peter White’s college. But was Nicholas Comerford an undergraduate there? 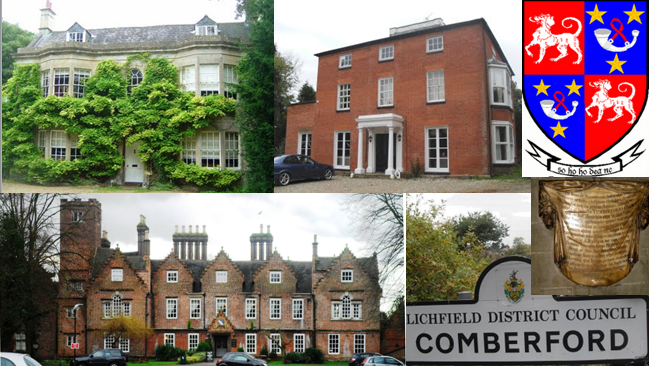 The Revd Dr Nicholas Comerford or Quemerford (ca 1541/1545-ca 1599) was a prominent Jesuit theologian from Waterford in the aftermath of the Reformation, and was the first of 16 members of the Comerford name who were Jesuits or members of the Society of Jesus in the half century between 1590 and 1640. He lived in Oxford, Waterford, Louvain and in Portugal and Spain, he spent some time living in Rome as the Pope’s guest, and at one time he was nominated as Archbishop of Cashel, although the nomination was blocked by the King of Spain and was never accepted by the Vatican. Nicholas Comerford was born in Waterford ca 1541-1545, the son of Patrick Comerford and his wife, […] Walsh. 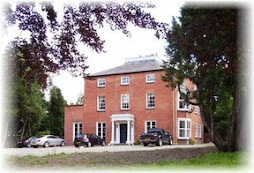 It is said that Nicholas was sent to school at Peter White’s famous academy in Kilkenny, although he may have been too old to have been one of White’s pupils. White was educated at Oxford, and was a Fellow of Oriel College before returning to Waterford, where he was Dean of Waterford Cathedral until he was ejected for nonconformity. He then established his famous academy or school in Kilkenny in 1565, and his pupils there included the historian Richard Stanihurst (1547-1618), and later the Franciscan theologian and historian Luke Wadding (1588-1657), as well as other members of the White, Comerford, Walsh, Wadding and Lombard families from Waterford and Kilkenny. After school, Nicholas Comerford went on to Oxford. Although it is not known which college he was a student in – perhaps White’s Oriel or his professors’ Magdalen College –we know he spent at least four years “in pecking at logic and philosophy” and graduated BA on 20 February 1563. 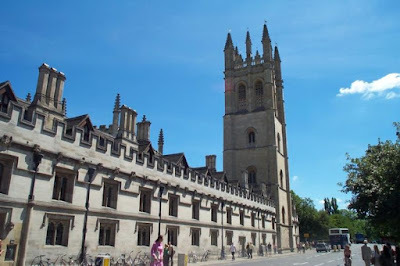 During his time at Oxford (ca 1559-1563), his contemporaries included Edmund Campion (1540-1581), a friend of Stanihurst and later a Jesuit martyr, who was a student at Saint John’s College and graduated in 1564; and Richard Stanihurst, who went to Oxford from Kilkenny in 1563. The Regius Professors of Divinity in Oxford during Nicholas Comerford’s time there as an undergraduate were Richard Smyth (1559) and Lawrence Humphrey (from 1560). Smyth was Oxford University’s registrar when by royal appointment he became the university’s first Regius Professor of Divinity in 1536. He was principal of Saint Alban’s Hall (later incorporated into Merton College) and Divinity Reader at Magdalen College. He was reported to have renounced Catholicism and the authority of the Pope at Oxford on the accession of Edward VI, but accounts show him as a Catholic again soon after, and he was replaced as Regius Professor in 1548 by Peter Martyr. Smyth and Martyr held a public disputation in 1549, and Smyth was arrested soon afterwards and imprisoned for a short while. On his release, Smyth left Oxford to become Professor of Divinity at Louvain, but he returned to England on the accession of Mary, became Regius Professor once again (1554-1556 and 1559), a canon of Christ Church, Oxford, and a royal chaplain, and he took a leading role in the trials of Thomas Cranmer, Nicholas Ridley and Hugh Latimer. Smyth was regius professor once again in 1559, but only briefly, and soon lost this position and all his benefices following Elizabeth’s succession to Mary in 1558. He was briefly imprisoned in Archbishop Matthew Parker’s house, and on his release fled to the continent. 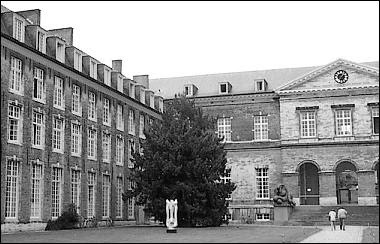 In Douai, Mary’s widower, Philip II of Spain, appointed him dean of Saint Peter’s Church and then in 1562 he became the first chancellor and Professor of Theology at the new Douai University. For most of Nicholas Comerford’s time at Oxford, however, the Regius Professor of Divinity was Lawrence Humphrey (ca 1527-1590), who had lived in Basel, Zurich, Frankfort and Geneva during Mary’s reign. There he made acquaintances with the leading Swiss reformers, and adopted their ecclesiastical. He returned to England on Elizabeth’s accession to the throne in 1558, and was appointed Regius Professor of Divinity at Oxford in 1560. A year later, he was elected President of Magdalen College, despite the opposition of the fellows, and gradually converted the college into a stronghold of Puritanism. In 1580 he was made Dean of Winchester, and when he died on 1 February 1590 he was buried in the chapel of Magdalen College. Nicholas was Rector of Kilconnell in the Diocese of Cashel until about 1570, when the Dean and Chapter of Cashel wrote to Thomas Butler, Earl of Ormond, on 19 May 1570 nominating and presenting the Revd William Phelan as his successor. In 1571, the notorious pluralist, Miler Magrath, became Archbishop of Cashel. With this appointment, Ireland, and the Diocese of Cashel in particular, were now unsafe places for a man of Comerford’s Catholic convictions. He moved to the Continent, and by 1574, he was back in Louvain once again. 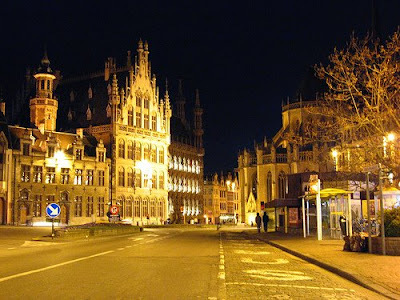 The Catholic University of Leuven or Louvain was founded in Brabant, or present-day Belgium, in 1425, and its distinguished students included Desiderius Erasmus and Adriaan Florenszoon Boeyens (Pope Adrian VI). In Louvain, he was a contemporary of Peter Lombard of Waterford, later Archbishop of Armagh. 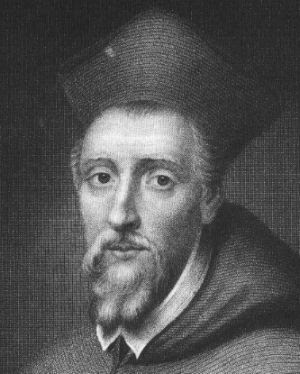 When Nicholas Comerford received his doctorate in theology (DD) at the Catholic University of Louvain on 23 October 1576, the occasion was marked by a poem in Latin penned by his cousin Peter Lombard (1555-1625) from Waterford, who later became Professor of Theology at Louvain and then Archbishop of Armagh: Carmen heroicum in Doctoratum Nicolai Quemerfordi. Nicholas returned to the Continent, and by 1578 it was reported that the chief Irish ecclesiastics then living in Rome on the bounty of the Pope included Dr Nicholas Comerford. 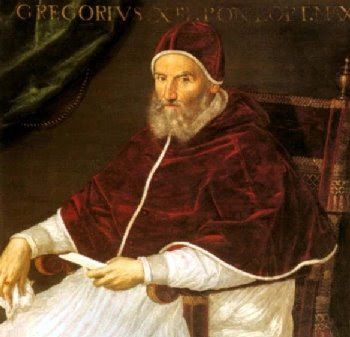 Gregory XIII was a liberal patron of the Society of Jesus and is best remembered for his reform of the calendar, giving his name to the Gregorian Calendar. Later in 1578, Nicholas Comerford was living in Porto in Portugal, where he was said to be “of great authority among the Irish by reason alike of doctrine and of probity.” Between 1578 and 1583, he joined the Jesuits or the Society of Jesus in Madrid, and was professed of the four vows. He spent some time in Rome, later moved to Porto in Portugal, and then lectured in theology in a number of colleges in Spain and Portugal. By 1590 he was in Lisbon. In January that year, Comerford was nominated by Cardinal William Allen (1532-1594) and others as Archbishop of Cashel in opposition to Miler Magrath, who was Archbishop of Cashel 1571-1622. 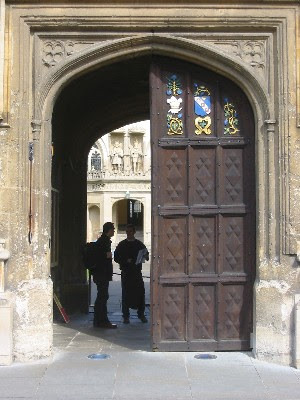 Allen had been the Principal of Saint Mary Hall, Oxford, which was closely linked with Oriel College, while Nicholas Comerford was an undergraduate at Oxford, and Allen – like Comerford – moved to Leuven in the 1560s. However, the nomination did not receive the support it needed from King Philip II of Spain. Six years before Comerford’s nomination, Dermot O’Hurley, the Roman Catholic Archbishop of Cashel, had been hanged at Dublin Castle on 20 June 1584. However, the Spanish monarch did not want Comerford to leave Spain for Ireland, and instead, the king offered him any other post he might chose in Spain. 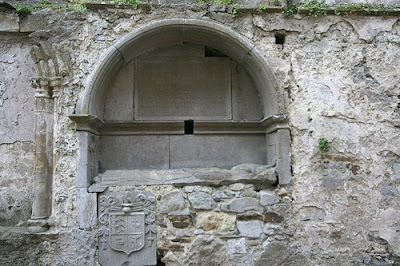 As a consequence, Comerford’s nomination as Archbishop Cashel was not accepted in Rome, and the see remained vacant until 1603, when David Kearney was appointed in 1603; a Comerford was eventually appointed to Cashel in 1693, when Edward Comerford was appointed Archbishop of Cashel in succession to John Brenan. The failure to become Archbishop of Cashel marks the end of Nicholas Comerford’s ecclesiastical career. It is possible that he continued to live out his days in Spain, although there is no further mention of Nicholas Comerford in the Jesuit records after 1590, and he is reported to have died in Spain ca 1599. Nicholas Comerford was the author of Answers to certain questions propounded by the citizens of Waterford, said to have been “a learned and pithy treatise.” He also wrote a number of tracts on philosophy and theology, some of his sermons were published, and he was the author of a poem in Latin, Carmina in laudem comitis Ormondiae (Songs in praise of the Earl of Ormond). Dictionary of National Biography, vol 4, p. 894 (where the date of birth is given as ca 1544); Hogan, Catalogue of Irish Jesuits (Dublin, 1880) p. 6, which also prefers ca 1544; Oxford Dictionary of National Biography (ODNB), vol 11, p. 866, where the date ca 1540 is preferred. More recently, Anthony M McCormack prefers ca 1541/1544; see Anthony M McCormack, ‘Comerford (Comberford, Quemerford), Nicholas,’ pp 715-716, in Dictionary of Irish Biography (eds James McGuire, James Quinn), vol 2 (Cambridge: Cambridge University Press, Dublin: Royal Irish Academy, 2009). ODNB 11, p. 866; McCormack, p. 715. J. Browne, Transactions of the Kilkenny Arch. Soc., 1. (1849-51), 221-29; Richard Stanihurst, Description of Ireland, Chapter 7; Power, Brenan, p. 244; Dowling, Continuity Ossory, pp 247-249. Foster vol 1, p. 314, which gives the date 20 February 1562-63; Brenan, Ecclesiastical History, p. 443; DNB 4, p. 894, which gives the date 1562 for his BA; Hurley says he graduated at Oxford in 1562, see Patrick Hurley, ‘Memoir of Dr Patrick Comerford, OSA, Bishop of Waterford and Lismore, 1629-1652,’ Irish Ecclesiastical Record, December 1887, p. 1083; ODNB 11 gives the date 1562(see p. 866); McCormack agrees with 20 February 1563 (see p. 715). J. Andreas Löwe, Richard Smyth and the Language of Orthodoxy: Re-imagining Tudor Catholic Polemicism (Studies in Mediaeval and Reformation Traditions: History, Culture, Religion, Ideas, 96; Leiden: Brill, 2003), passim; JP Spellman, ‘The Irish in Belgium,’ Irish Ecclesiastical Record, July 1886 (Dublin: 1886), p. 642. C.H. Cooper and T. Cooper, Athenae Cantabrigienses (Cambridge 1861), vol 2, pp 80 ff. DNB 4, p. 894; ODNB 11, p. 866; McCormack, p. 715. Ronan, p. 114; Cal State Papers Irl 1601-1603, p. 663. Carew vol 1, p. 385. Ormond Deeds, 5, p. 185. Foster 1, p. 314; Spellman, pp 642-643; Hogan, Catalogue of Irish Jesuits, p. 6; ODNB 11, p. 866; McCormack, p. 715. ODNB 11, p. 866; Hogan (1894), p. 74. Hogan, Catalogue of Irish Jesuits, p. 6; DNB 4, p. 894; ODNB 11, p. 866. Cal State Papers Irl, vol 4 (Elizabeth 1588-1592), p. 136; ODNB 11, p. 866. ODNB, vol 11, p. 866. Cal State Papers Irl vol 4 (Elizabeth 1588-1592), p. 295. Hogan, Catalogue of Irish Jesuits, p. 6; Spellman, p. 663; DNB 4, p. 894; ODNB 11, p. 866; McCormack, p. 715. Brenan, Ecclesiastical History, p. 444; ODNB 11, p. 866; McCormack, p. 715. (c) Patrick Comerford, 2009, 2010, 2013. Last updated: 31 March 2009; 7 August 2009; 10 August 2009; 10 April 2010, 19 November 2010; 13 April 2013; 20 February 2019.